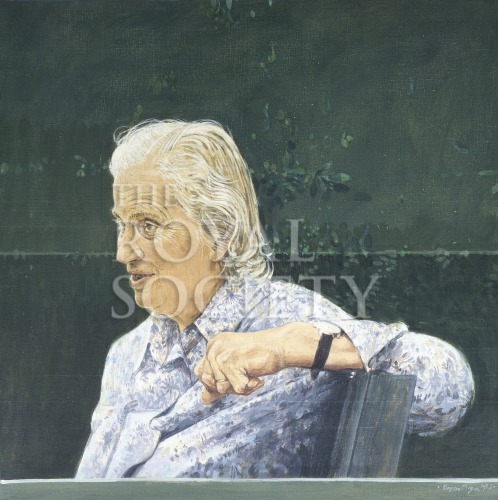 Half-length portrait of Dorothy Hodgkin, seated, with her face in profile. She wears a light blue blouse with a floral pattern, visible sleeve turned up at the cuff to reveal a black-strapped wristwatch. Her left arm is casually laid across her chair back, showing her hand and wedding ring. Her hair is white, parted and naturally worn, shown against a rich, dark green background. Dorothy Mary Crowfoot Hodgkin was elected a Fellow of the Royal Society in 1947. The Royal Society’s Council Minutes state in October 1982 that: “Reported the gift to the Society of a portrait of Professor Dorothy M.C. Hodgkin, painted by Bryan Organ and provided principally by private subscription from a number of Fellows and Foreign Members and others, together with some firms and institutions.” [Royal Society Minutes of Council, Printed, vol.27, 1979-1982 p.928 meeting of 14 October 1982].